Supper Club #7: Three Words: Serves. Big. Portions. All dishes cooked by One Big Table were made from 'sustainably produced, locally acquired food by farmers who were paid fair wages for their labor' such as Hawthorne Valley Farms and Rooftop Farms. One Big Table is probably the most generous full plated 5 course supper club I have been to so far. It is held in a 250 sq. feet loftspace with airy 15-feet. ceilings, plus an open space kitchen that adds an extra 150 sq. feet. They seat 12 guests, provide complimentary wine pairing and hosts a post music show by Alternative/R & B violinist Marques Toliver. This was a 4 hour event. Cocktails and hors d'oeurves were promptly started at 7:30pm, for the July 18, 2009 dinner. 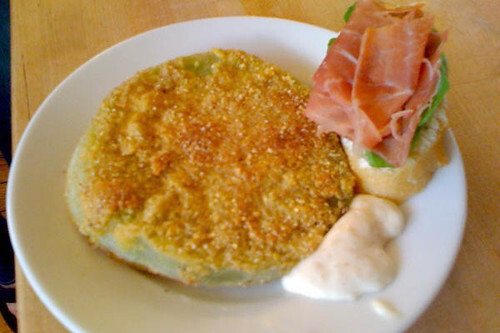 I had the 'Bushwick Marlie' made of blueberries, basil, simple syrup, club soda, organic vodka, and munched on an XL fried green tomato with a side baguette topped with prosciutto and ricotta. 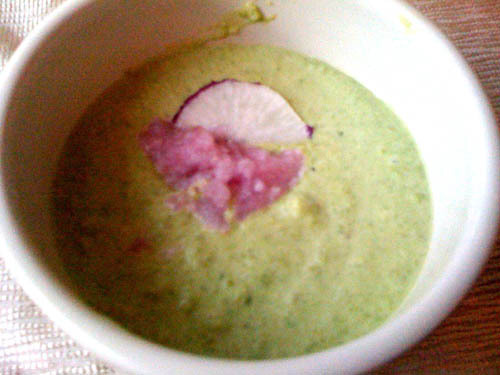 As we all settled in to our seats, we started with a chilled sweet pea soup made with berries, and a dallop of radish sorbet. 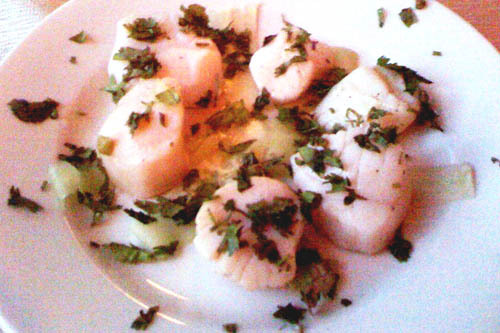 For the main course, I chose the scallops ceviche. Yes, I was served 6 large, plump scallops. Even at the 5 star restaurants in NY you would only get served a maximum of 4. 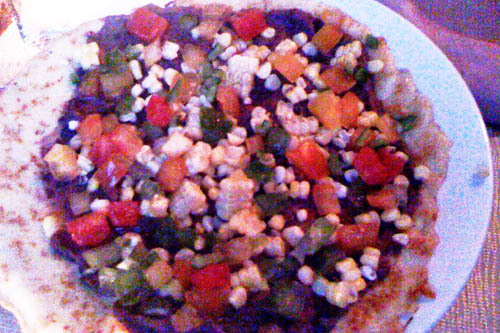 The other option for main entree (which my neighbor chose) was a warm crepe topped with heirlooom red beans, corn, and heirloom tomatoes. The portion was so filling, she shared it with 2 other guests. The meal ended with a bowl of fresh sugar snap peas with green onions and cilantro to cleanse the palate. And then a Greenmarket inspired dessert, blueberry cobbler ice cream. 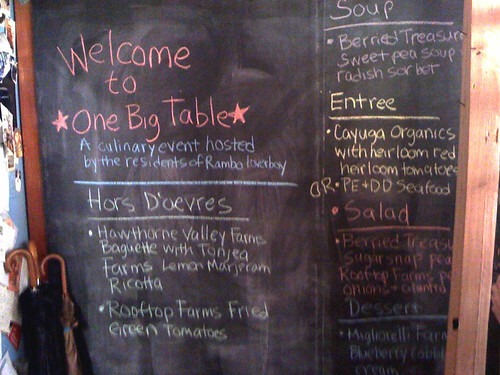 The next One Big Table dinner will be Saturday, August 8th at 7:30 pm. 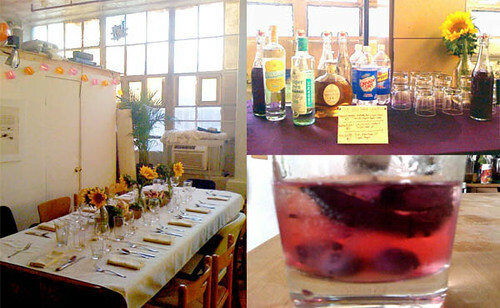 Make your reservation at: http://www.onebigtablebrooklyn.com/.